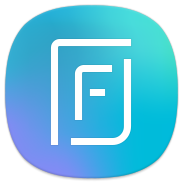 Samsung Galaxy Friends is an accessory platform service that allows the user to enjoy a variety of content quickly and easily by simply connecting an accessory, without having to install additional applications. Now, enjoy content on your mobile phone more easily and conveniently through Samsung Galaxy Friends! ※ Samsung Galaxy Friends is an app for accessory platform service, and it is an app that runs only when the accessories are connected. There is no icon or action after installation. – The user can automatically download content without additional controls or installing an additional application. : A content-specific wallpaper/lock screen and an app shortcut are provided. : Transform your phone into an exclusive content phone with a brand new design. – New content will be updated for a certain period of time through the Samsung Cloud server. 1. Connect the Samsung Galaxy Friends accessory to a mobile device. 2. The setup screen appears. 4. Have the content downloaded automatically from the Samsung Cloud server. 1. The app described above can only run on the Android OS. 2. Content can be accessed only when a data connection is available, such as 3G/4G or Wi-Fi. 3. A non-Wi-Fi environment may incur charges, so it is recommended that the service be used via Wi-Fi.